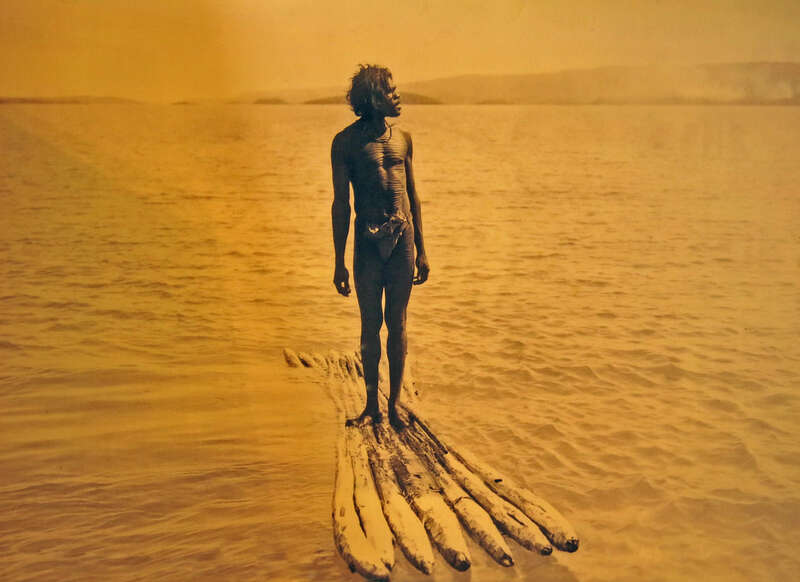 Aborigines of Australia - an Australian Aboriginal person is a person of Aboriginal descent, albeit mixed, who identifies themselves as such and who is recognised by the Aboriginal community as an Aborigine. 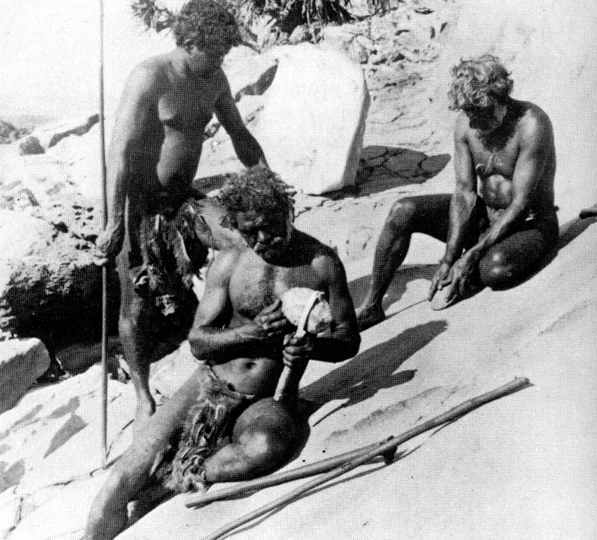 It is always a problem to decide how aborigines came to Australia, possibly more than once. 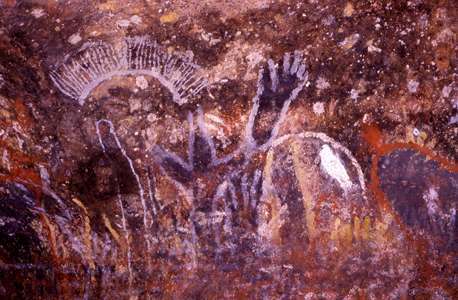 This painting from 20 000 to 30 000 years BP depicted on a panel of Bradshaw rock paintings in the northwest Kimberley region of Australia shows a large canoe containing four people, and the paddles that were used for propulsion. Note also the high front prow and smaller rear raised stern, useful for sea voyages where significant waves will be encountered. None of the paintings of large canoes depict sails. 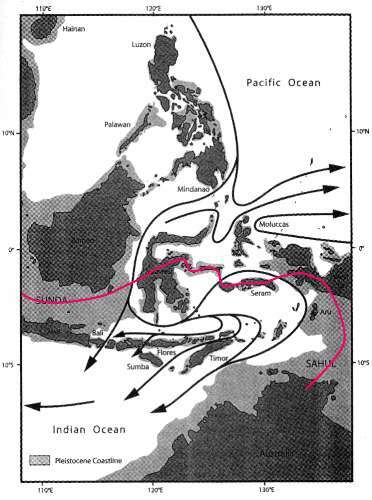 Oceanic currents in Southeast Asia at times of low sea level. The direction of ocean currents and the position of intermediary islands makes the most probable direction for settlement of Australia to be from Sulawesi past the island of Seram to the coast of the island of New Guinea, in my opinion. The coast could be hugged on a series of island hops leading from Sulawesi, with favourable currents, with only three major crossings. Although there would always be at least one crossing of sixty nautical miles or more of open ocean, the selection of appropriate yearly weather patterns would have made such a journey possible. I have put in a very hypothetical path for the journey from SE Asia to Australia, involving a total of three significant sea crossings, the last being the most problematical. I should add that the path I showed is the hypothetical path a single group of people could have travelled if they knew where they were going. In fact the first crossing from the Java/Sunda/Borneo mainland would have been by coastal dwellers with water craft used for transport and fishing. Once on the other side, they would have presumably settled on a coastline where there were no humans, some would have moved inland to exploit niches there, but it would then have taken thousands of years for their descendants to spread around the coastline of Sulawesi, until the water voyage was undertaken again across to Seram. Then further time would elapse until all the niches were used up on the coast of Seram, and the final, difficult voyage to New Guinea and Australia. I don't think the 'logical' path along the Java/Bali/Flores island chain is a goer, because of the longer and much more difficult voyage across choppy seas from Timor, with a current setting at right angles against the closest path to get to the coast of Australia. The first people to arrive in Australia are likely to have sailed east from Borneo to Sulawesi and island-hopped to New Guinea, according to recent research. 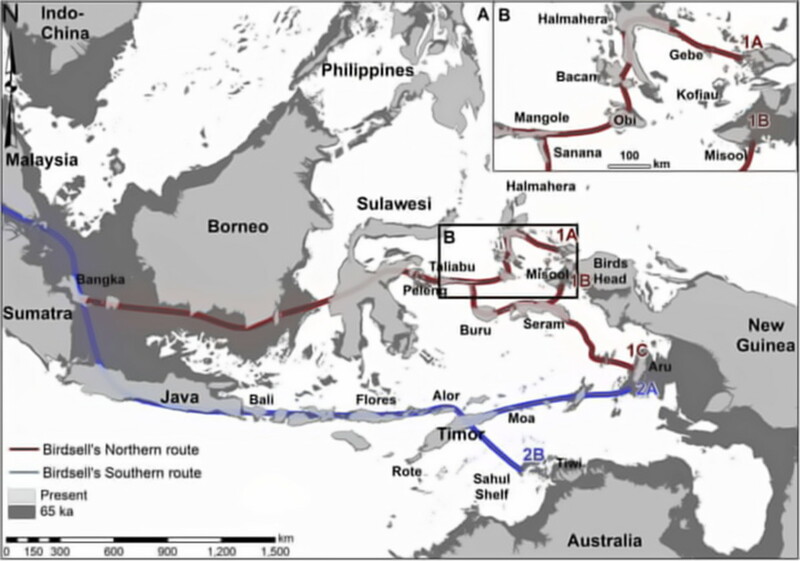 A study led by Australian National University PhD candidate Shimona Kealy and published in the Journal of Human Evolution has modelled the most likely route from southeast Asia to the Australian mainland based on which pathway would have required the least expenditure of energy and resources. Kealy said she hoped the research would help answer the question of why archeological sites in Australia — which show human occupation around 65 000 years ago — are so much older than sites that have been discovered in the countries that were long suspected to be en route. Her modelling identified the least-cost route as going from Borneo to Sulawesi and through a series of smaller islands to Misool Island off the coast of West Papua. New Guinea was connected by land to Australia until about 10 000 years ago, meaning the first people could walk down through what is now Cape York to the rest of the continent. 'The visibility and the shorter distances between the islands is what really makes [this route] much more feasible for travel,' she told Guardian Australia. 'Most of the time that visibility is shore-to-shore visibility.' Kealy also tracked other factors, like whether a particular route would involve going over or around a hill, in order to determine the most likely path of travel. 'We are looking at the first sea journey of our species,' she said. 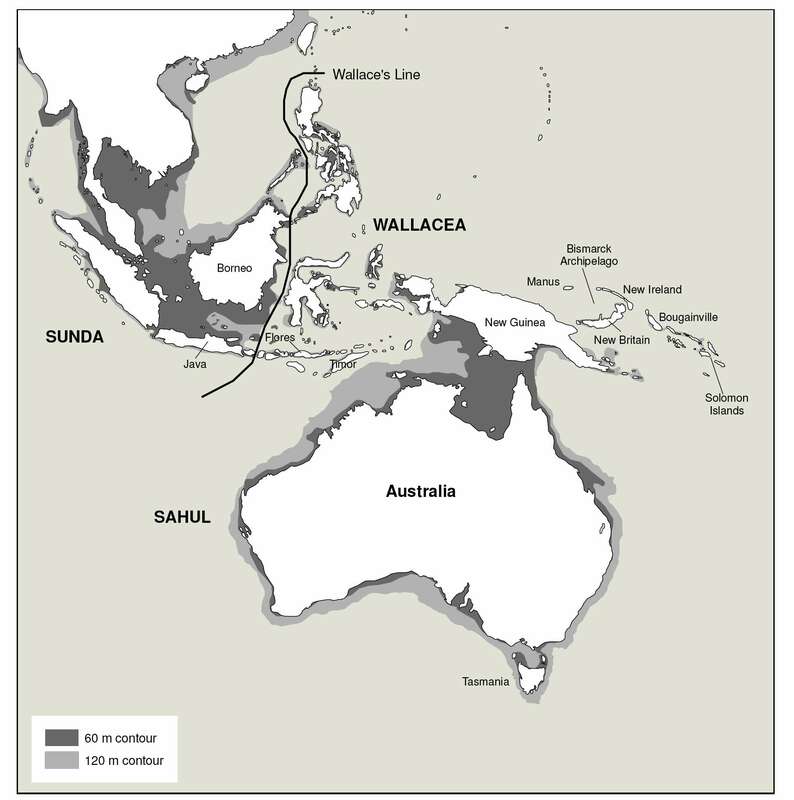 Birdsell's northern route goes through Sulawesi to West Papua and the southern route goes through Timor and ends with a significant sea crossing to the Northern Territory or Kimberley coastline. Archeologists have since found a number of sites in East Timor that show proof of human occupation, but none are older than 45 000 years old. Artefacts from the oldest known site in Australia, a rock shelter at Madjedbebe in the Jabiluka mining lease within the Kakadu national park, on Mirarr country, have been dated at 65 000 years old. A site on Barrow Island off the coast of Western Australia has been dated at 50 000 years old. 'Obviously people had to travel through these islands somehow to get to Australia so presumably the dates that we found in Australia should be younger or around the same age as the dates that we are getting from these East Timor sites,' Kealy said. The timeframe of 65 000 plus years is not universally accepted in the academic community. Another recent study asserted 50 000 to 55 000 years was the most likely timeframe but Kealy said her modelling tracked changes in both coastline and sea level from 45 000 to 70 000 years ago. The sea level was at its lowest point 65 000 years ago and highest 70 000 years ago. Another very useful map of sea levels at two heights, -60m and -120m. Prepared for a volume tentatively entitled The Global Origins and Development of Seafaring, edited by A. Anderson, J. Barrett, and K. Boyle, scheduled for publication by the McDonald Institute for Archaeological Research, Cambridge University, Cambridge, UK. 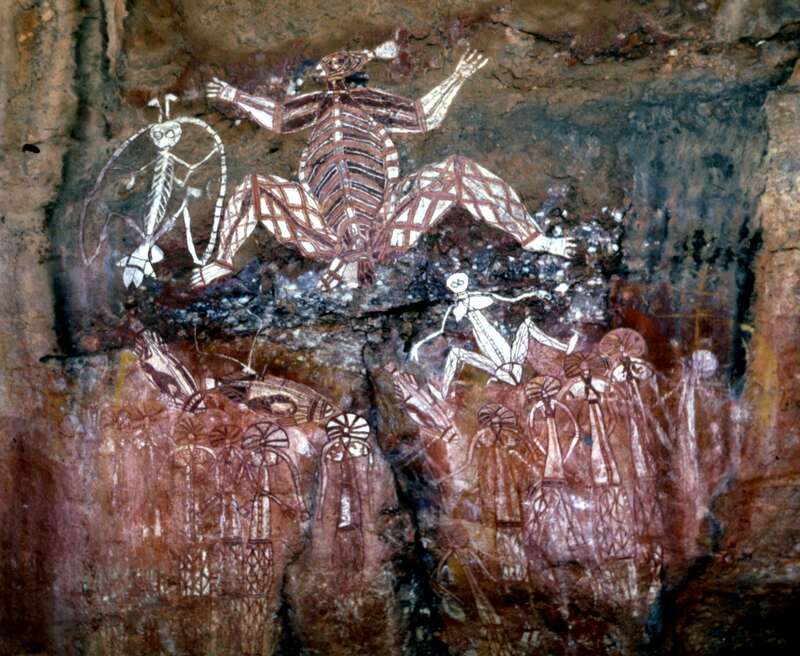 A rock painting that has been hidden for almost 200 years of an early Australian explorer believed to be Ludwig Leichhardt will be shown to non-Aboriginal people for the first time. The artist who made the painting in rugged stone country in Arnhem Land had never before seen a horse or a white man, experts believe. The artist reveals his fascination with a four-legged animal that lifts its tail to urinate, had knee and chest guards and had a weird-looking figure sitting on its back. 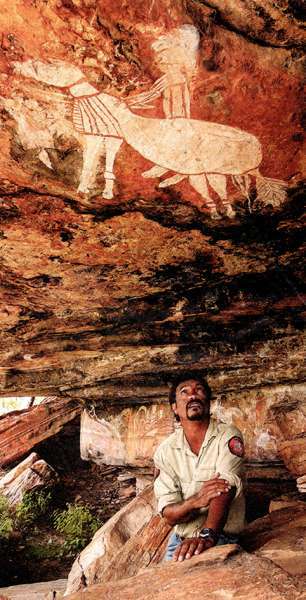 "If you had never seen a horse before, I guess that is what you would draw," says Andy Ralph, whose family are among the traditional owners of the land where the painting has been re-discovered after first being recorded in the mid-1990s. Leichhardt's horses had knee and chest guards to protect them as they passed through bush from Queensland to Port Essington, near Darwin, in 1845. Mr Chaloupka discovered the painting in about 1994. 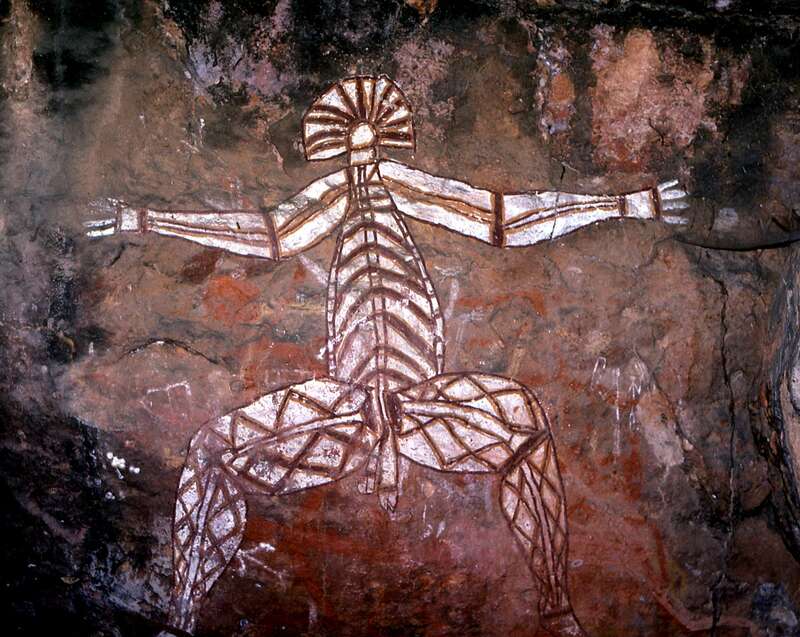 But he had not taken anybody else to see it until last year when traditional owners asked him to suggest sites that would interest trekkers as part of a push to develop indigenous tourism in the area. "The painting is definitely of an early explorer and probably is of Leichhardt," Mr Chaloupka said. "It is an important piece of work. "The painting certainly post-dates 1845 because Leichhardt was the first white person to cross the Arnhem Land plateau." The area's traditional owners from the Bolmo Dedjrungi-Dordokkiyu clan plan to open the site to small groups who will be flown in by helicopter. A masterpiece, completed in the 1960s, at Kakadu. 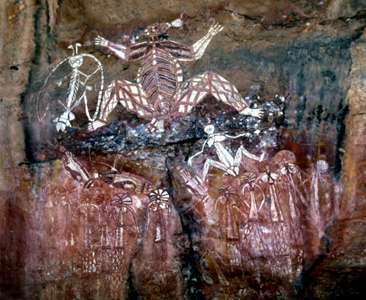 Painting in a cave at Uluru. 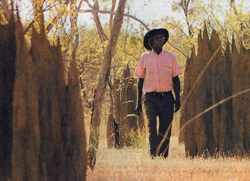 Making his marks: Aboriginal tracker George Musgrave, who recently recorded his knowledge so the art would not die out, takes to the bush near Laura. George Musgrave is a master of a dying art. One of Queensland's few remaining black trackers, he has lost count of how many lives he has saved. His senses are so sharp he can follow a week-old trail through dense scrub at night and is often called on by police to find walkers lost in the wilds of Cape York. "Every time I find somebody, every time," the Kuku Thaypan elder told The Australian during a visit to his home at Laura in the far north of the state. "You cannot beat the tracking." Just two weeks ago it took him less than a day to find an off-duty policeman who became lost during a hunting trip near the remote Aboriginal community of Aurukun. However, at the age of 85, Mr Musgrave is worried that the skills he learnt while growing up on a remote cattle station will not be passed on to future generations. It is the potential loss of his culture that prompted him to take part in a recently completed project to record his knowledge so it will not be forgotten. "It's important to preserve," he said. "It's nice to have it all done, all the recordings ... we don't want them to be left alone." Born underneath the homestead at a remote Cape York cattle station, Mr Musgrave was hidden in a mailbag to avoid being forcibly removed from his parents. He never attended school. Instead his father insisted he and his brother learn the art of tracking. For him the land is crisscrossed with the fading and fresh trails of animals and walkers. He can identify tracks that are up to two months old. "Everybody says I can smell a track, but I can't smell it, I can see it," he said. "I can see grass tracks, I can see you tread over a leaf, I can tell how old the tracks are and I can tell a woman's track from a man's track and a child's track from the adult." A former community policeman and musterer, Mr Musgrave is often relied upon by police to find tourists who have wandered off into the bush, misjudging the terrain and climate. "Nobody knows how to track any more, it's a bad thing," he said. "I track everybody and it's good because if a kid gets lost I can find him." Photo: This excellent portrait is possibly by Eddie Safarik but is unattributed in the article. I wish I had a better quality image. One of Australia's best-known bush Aborigines, and one of the last of the recognised indigenous trackers, George Musgrave, died yesterday morning. Mr Musgrave, 85, was born under the homestead of a remote Cape York cattle station, and was hidden in a mailbag to avoid being forcibly removed from his parents at Laura, in Queensland's central Cape. He never attended school and his father insisted he and his brother learn the art of tracking in their Kuku Thaypan tribe. In August last year, despite his advancing years, Mr Musgrave was called on to find an off-duty, pig-hunting police officer who had been missing overnight at remote Aurukun community on western Cape York. Mr Musgrave had him tracked and safely back home within a day. The respected elder said in a recent media interview that he had 'lost count" of the number of people he had tracked and saved - many of them in recent years being tourists and backpackers who became lost on the rugged Cape. He also expressed concern that his tracking art would be lost because young people were no longer expected to find their own bush tucker. "Everybody says I can smell a track, but I can't smell it. I can see it," he said. "I can see grass tracks. I can see you tread over a leaf; I can tell how old the tracks are and I can tell a woman's track from a man's track and a child's track from an adult." "Nobody knows how to track any more, and it's a bad thing. I track everybody and it's good because if a kid gets lost, I can find him." Last year saw the completion of a project where both men recorded for future scholars their Agu Alaya language, a history of heir land, and stories of their lives. Throughout his life he was a stockman and musterer, and a community policeman. 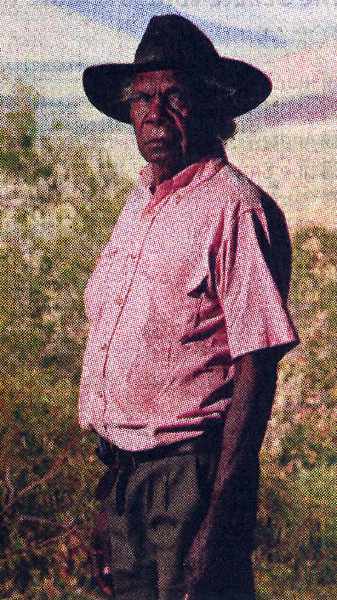 Mr Musgrave was well known to thousands of four-wheel-drive tourists as the guide who led them through the rock art displays around Laura for the past two decades, often accompanied by his lifelong friend and now the only remaining Kuku Thaypan elder, Tommy George. In May last year both men found themselves in unfamiliar robes when they were awarded honorary doctorates by north Queensland's James Cook University - in recognition of their contribution to academic understanding of their culture, law and country. The two friends made headlines years ago when they campaigned to protect the world renowned Quinkan rock art near Laura - the same art galleries that they showed to visitors over the years. 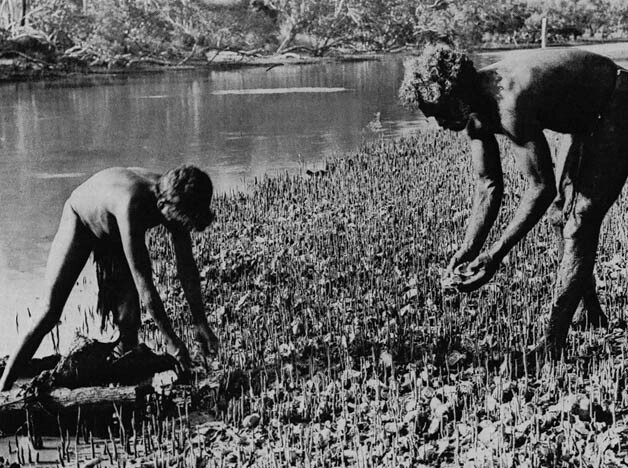 They were founders of major fixtures on Cape York including the internationally renowned Laura Festival of traditional Dance and Culture, and the Cape York Land Council. 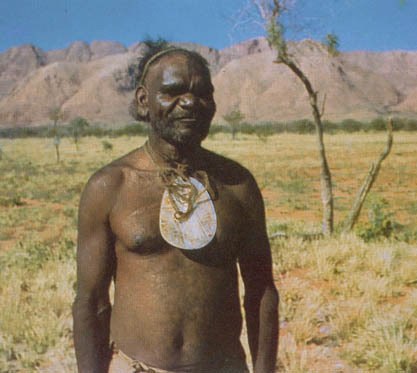 It was not uncommon for pearlshell pendants, such as this one worn by a tribal elder from Mt Liebig In central Australia, to be found as far south as the Great Australian Bight. This pendant was probably manufactured on Australia's northern coast. Extensive trading routes were established with the products of Aboriginal industry being transported right across the country. This map shows the trade routes for pearl and baler shells. 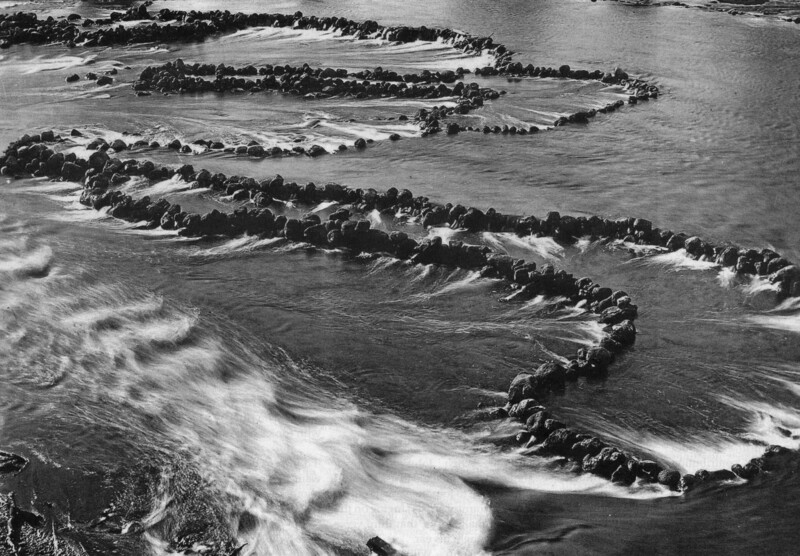 River fish traps like these near Brewarrina, New South Wales, were built using a complex network of rock walls designed to channel fish of varying sizes into specific catchment areas. Worana man, Samson, 198 cm tall, standing on a mangrove log raft, Camden Harbour, 1917. 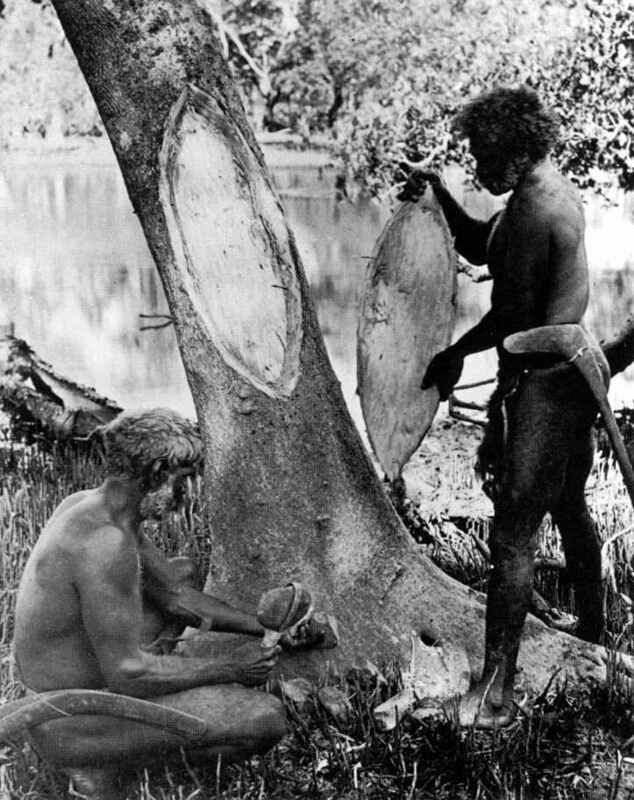 Australian Aborigines removing bark from a tree to make a shield. The men are carrying a variety of tools. 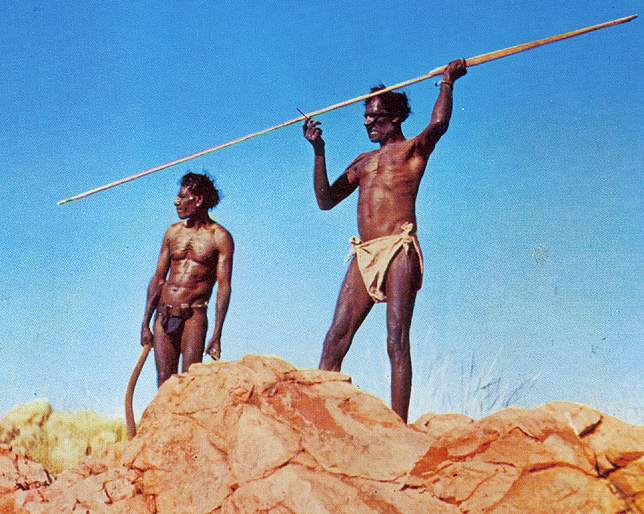 The one on the left has two boomerangs in his belt and is using a stone axe hafted in bent cane and a stone wedge, and his companion carries a throwing stick/club. 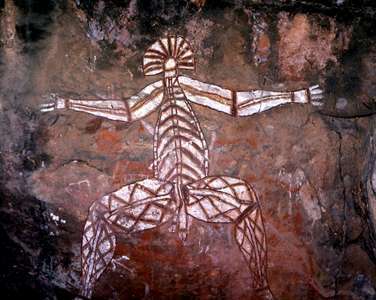 An Australian aborigine holding in his left hand a spear thrower, or woomera, with which he increases his throwing power. This canoe tree in the Backwater area (yes, that's its name, and it is self descriptive!) 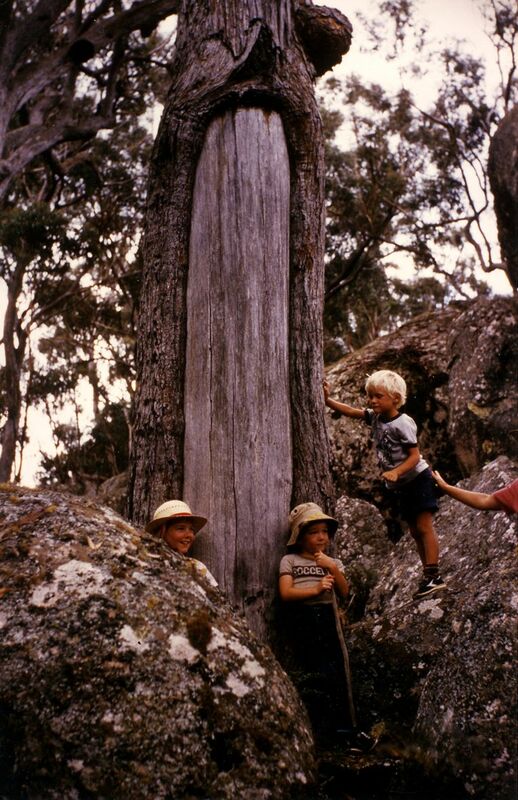 of the Northern Tablelands of NSW shows the scar left when bark was removed in order to make a canoe. 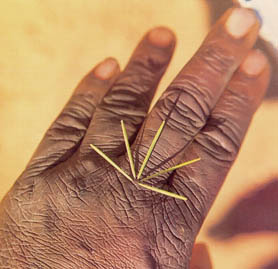 Traditional knowledge, oral instruction and stylised mapping were all important to Australian Aborigines in defining the type of water supplies available in a particular region, and assisting in their location. Observations of birds, especially the more sedentary species such as the zebra finch (Poephila guttata), could be significant. 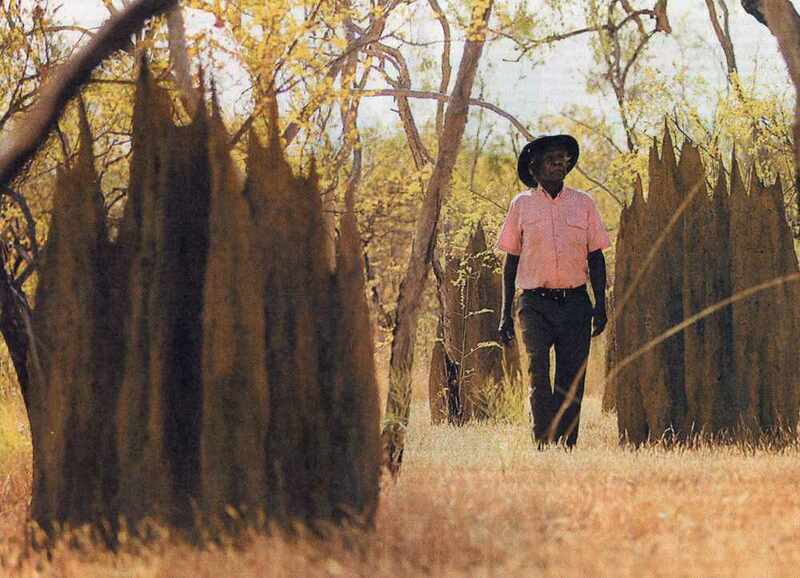 Specific sources of water utilised by indigenous people included; flooded gnammas (rock-holes), soakage-wells in permeable sediments, clay dams, flooded claypans, riverine waterholes, mound springs, rain-water accumulated in tree hollows (especially in Allocasuarina decaisneana), water from excavated tree roots (especially from mallee eucalypts), dew, and water from the body of the water-holding frog (Cyclorana platycephala).